Albums such as Supernatural, Shaman and All That I Am featured vocalists Rob Thomas, Seal, Dido and others in a calculated move to sell CDs, which is fine, given that the music business is, after all, a business. 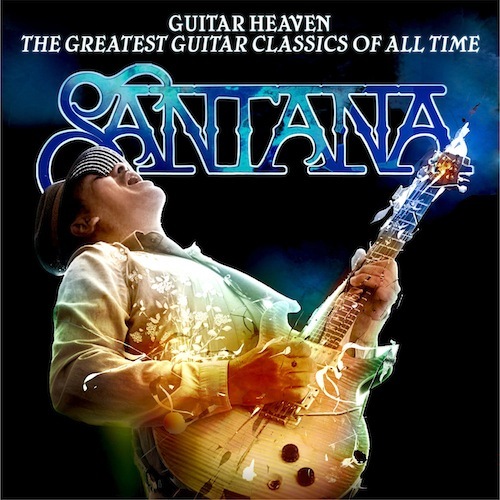 But the latest Santana/Davis project, Guitar Heaven: The Greatest Guitar Classics of All Time, may well be the final nail in the coffin of AOR. As for Santana the guitarist, a lot of this album is the same thing he’s done for the past 40 years, bending one screaming note for three measures while people call it art. He does turn in a great performance on the old Willie Dixon/Jeff Beck nugget “I Ain’t Superstitious,” showing guest vocalist Jonny Lang how the old guys do it. And his work on “Riders on the Storm,” featuring Linkin Park’s Chester Bennington, may be his best playing on the album, with the song’s atypical structure forcing him to go outside a little. But much of this album misses the mark horribly, barely making it a cut above those “music in the style of (fill in the blank – Eagles, Garth Brooks etc. )” records. The first single from the CD is “While My Guitar Gently Weeps,” with a vocal by India.Arie and Yo-Yo Ma on cello. This song is an absolute classic, almost sacred, and Santana’s playing makes this thing almost unlistenable. Where Eric Clapton brought it to life by making a statement and leaving some space, Santana starts overplaying almost immediately. And the ghastly treatment of AC/DC’s “Back in Black,” with Nas rapping the vocal against Santana’s incessant wah-wah pedal…please, somebody get me outta here. And Cornell notwithstanding, “Whole Lotta Love” with congas? I don’t think so. Here’s the big question: Since Santana himself is a guitar god, why are there no Santana songs here? Like maybe a new version of “Black Magic Woman,” where Carlos can really shine on some nice minor key blues licks, with perhaps Ian Astbury or Eddie Vedder doing the vocal? It’s hard not to be too judgmental here, but his contemporaries – i.e., Clapton, Beck, even Neal Schon – are still trying to make a go of it, and Santana does an album of covers? This will be a good record for backyard barbecues and beers, but not for much serious listening.